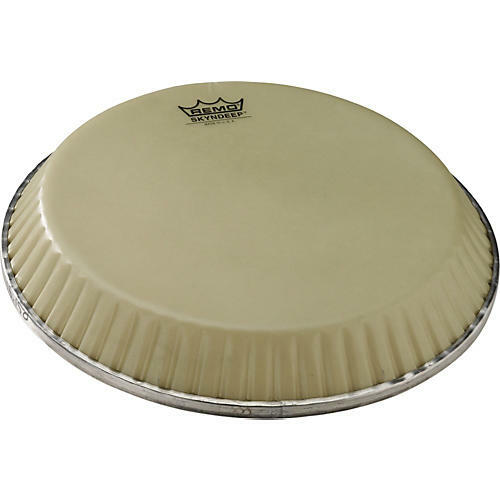 Open Box Remo Crimplock Symmetry Nuskyn D2 Conga Drumhead 12 in. Nuskyn is a major breakthrough in drumhead technology that may be Remo's greatest innovation yet. Frequency analysis of Nuskyn shows that it closely resembles the performance of animal skin, while actually expanding the sound response spectrum dramatically. Nuskyn sounds natural, warm, and full-bodied with enhanced low and mid-range frequencies, without any lingering high-pitched overtones. Crimplock Symmetry was created to add flexibility in Remo's manufacturing while increasing available drumhead dimensions. This means, Crimplock Symmetry drumheads can fit more conga drum models from the various drum manufacturers in the industry. With Remo's most technically advanced drumhead technology and input from the best percussionists in the world, Remo has improved the sound and feel of drumheads. Remo synthetic drumheads provide easy tunability, durability, and playability-giving the world's top players the tools they need to play their music.